Tuscany is a much sought-after holiday destination amongst wine lovers, and it’s difficult not to be moved by the stunning scenery, prestigious cultural heritage, and deliciously simple cuisine. These are my top things to do in Tuscany! The Fiat 500 is iconic, and is instantly recognisable as a symbol of Italian style with true retro flair, and in my opinion there is no better vehicle to take to the rolling Tuscan roads in! 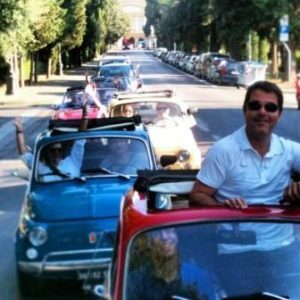 All of the classic Fiats are original in every detail, and whilst cruising through country roads with panoramic views of monasteries, vineyards and olive groves, you will discover the hidden side of Tuscany. 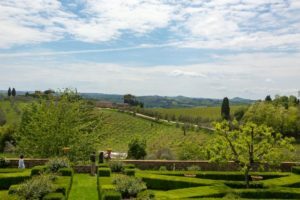 With our tour partner, you can complement this authentic experience with the opportunity to relax and enjoy a traditional Tuscan lunch, washed down with local wine in a delightful setting. Italian cuisine is loved across the world – pizzas, pastas and of course the ultimate gelato– unlike ice cream you have tasted anywhere else in the universe! 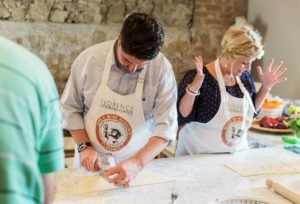 We like to encourage our guests to enjoy the experience of making Pizza and Gelato the way the Italians do… the experience of being taught by Tuscan chefs the traditional way is truly unique, and of course the tasting of your own creations is the best part of the day. When I travel to Italy I have one vital rule – EAT GELATO DAILY – definitely my top tip for anyone heading to this beautiful region! Twice every year, the Palio takes place in Siena, so on the 2nd July and 16th August you will discover a different side to Siena, with the Piazza del Campo bursting at the seams with excitable locals and enthusiastic tourists! The Palio is definitely one of the top things to do in Tuscany, it’s an ancient sporting event, where the various contrade of Siena (which are the various districts of the city) compete in an impressive horse race in the Piazza del Campo. Originally, there were about fifty-nine different Contrade, however only seventeen remain today. Each Contrada has its own emblem and its own colours and each represents a specific area of the city, in fact you can see the flags of each Contrada as well as its emblem displayed in the streets. The Palio has been taking place in Siena for centuries, records show that it was already being held in the 6th Century and is a big part of the people’s life. The Sienese are truly passionate about it, as every citizen in Siena belongs to a specific Contrada from birth. It’s well worth embracing the spectacle that is the Palio, and the infectious atmosphere will delight anyone lucky enough to be in Siena on these dates. 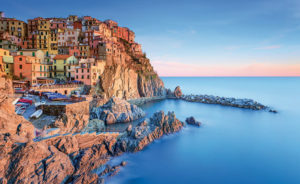 One place not to be missed whilst in the region is the stunning UNESCO World Heritage Site of Cinque Terre, where earth and sea blend to create a unique landscape. The area consists of eighteen kilometres of rocky coasts with caves, beaches, paths and breath-taking views! With the National Park being located around 2 hours’ drive from Florence, many of our guests enjoy a day tour which takes them through the Cinque Terre National Park, and my favourite part of this spectacular area is Monterosso, known as the ‘pearl of Cinque Terre’. Castello di Fonterutoli has been the heart and soul of the Marchesi Mazzei history and wine-production for nearly 600 years. Owned by the family since 1435, the estate still retains its original form, that of a tranquil country hamlet, surrounded by 650 hectares of wood, vineyards and olive groves. A cluster of houses, the church of San Miniato and the villa, built at the end of the 1500s, tell the story of a family deeply rooted in Tuscan tradition. 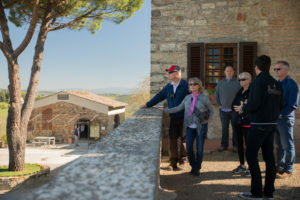 This is a unique place, and there is no better way to experience the real Tuscany, along with tasting the famed wines from this renowned region. So, there you have it! My top things to do in Tuscany!